The Late Shows is an annual event and culture crawl around some of NewcastleGatesheads best venues. Some attractions such as Seven Stories are opening up late especially for the evening and others will be providing additional activities and teaching skills you did not realise you had. The atmosphere is fantastic and families are more than welcome. Best of all - it's FREE! 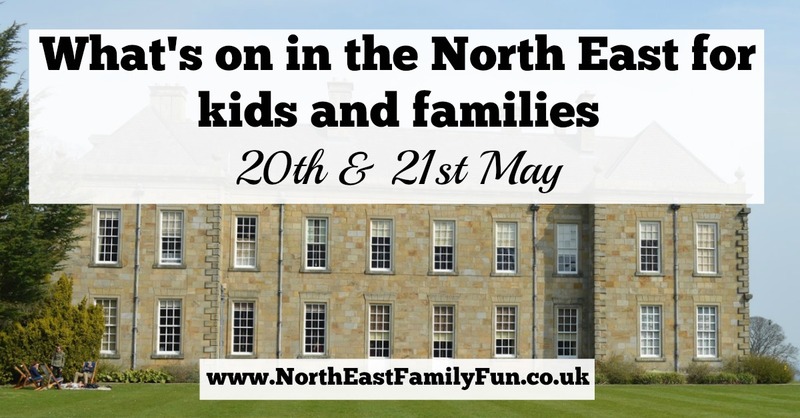 You can find out more over on Sprog on the Tyne who has produced a fantastic guide for families. 6 Rugby League matches will take place between 12 teams at St James Park this weekend as Dacia Magic Weekend returns for it's third year. There will be an official fan zone, top North East food stalls, player interviews and entertainment. Tickets are available from £12.50 here. The award winning family rave is launching in Sunderland at 'Independent' this Saturday with their flower power event. There'll be a live DJ, glitter cannons, bubbles, balloons, crafts, toddler play areas, free tattoo transfers and glow sticks and chill out areas. Tickets are from £6 (pre-walking babies are free). Find out more and buy tickets here. Join the Great Museum Mouse for story and songs before taking a toddler tour around the museum using a Toddle Truck. There will be 6 things for you to find using a special toddler magnifying glass. Free event but places should be reserved. Find out more here. Drop into the museum between 1-3pm to join in with this additional activity where you can create your own Tutankhamun mask to wear. Included with museum admission. More details here. Entry to this Spring Show is just £2 per person (parking and under 1's are free) and there's lots to see and do including equine displays, dog agility demos, sheep shearing demos, meet farmyard animals, archery, Punch and Judy shows, free zip line, birds of prey......eMore details here. There's so much to offer in this region and your blog always gives me so many ideas of places to visit and things to do! I love the fact that the NE Cancer Run is on this weekend as it's on my doorstep, so I'll definitely be popping along with little Cyrus to cheer everyone on. Oh I hope you Instagram story it! Wow! So much to do and some of them for free! It's always difficult trying to keep the kids entertained during holidays so this guide is invaluable for families looking to keep their children out of mischief! Wow there are so many great things on! My kids would love that toddle truck. Wow i didnt realise there was so much to do this weekend, we are out on Saturday at a local fair and then Sunday at Beamish for the emergency services event! We love Houghall so might see if we can swing by there too on the way home for the display! So much to do we really are lucky to live up 'north' oh and to have someone to put it all together for us! I've done work at Blyth battery but never visited. Great to be reminded of it. So much going on this weekend. Shame I've used up all my 'spoons' (spoonie reference!). We've been looking for car boot fairs in the area - where is Souter Lighthouse?